Even more, she worked to preserve ballets that might otherwise have been forgotten. In 2007 she created the Balanchine Preservation Initiative dedicated to reviving Balanchine rarities, some of which, like Pithoprakta (1968) and the "Contrapuntal Blues" pas de deux from Clarinade (1964), are performed by no other company. Suzanne Farrell rehearsing Balanchine's Gounod Symphony. Photo by Rosalie O'Connor, Courtesy The Kennedy Center. But her troupe has faced challenges. Based at The Kennedy Center, which also underwrites the company's budget, the ensemble has always been a part-time affair, providing work for only short periods. This meant that the roster of dancers varied from year to year (though there were many who returned), as did, inevitably, the quality of performances. Overall, though, Farrell has been pleased with the results: "I feel proud of what I've done. This company is extraordinarily unique, and human." The question, then, is why close now? It is not entirely clear whether the decision was Farrell's to make. According to a Kennedy Center representative, the arts complex's upcoming expansion created "a natural moment to transition." Farrell is also circumspect. Asked why, give the company's hard-won successes, she did not decide to persevere, she answers, enigmatically, "I don't really know. If I had my choice I would go on forever." Perhaps someday the details behind the decision will emerge. For its final season, December 7–9, the company will perform a group of works closely linked with Farrell's own decades-long relationship to Balanchine. Serenade, from 1934, contains the first solo she ever danced at New York City Ballet, the "Dark Angel," set to the elegy from Tchaikovsky's Serenade in C. Tzigane and Meditation were both made for her. Chaconne, set to ballet music from Gluck's opera Orfeo ed Euridice, contains one of Balanchine's most voluptuous pas de deux, created for Farrell and Peter Martins. Gounod Symphony, a large, formal ballet in the French style, is the latest rarity staged by Farrell. The arc of a career, on a single program. 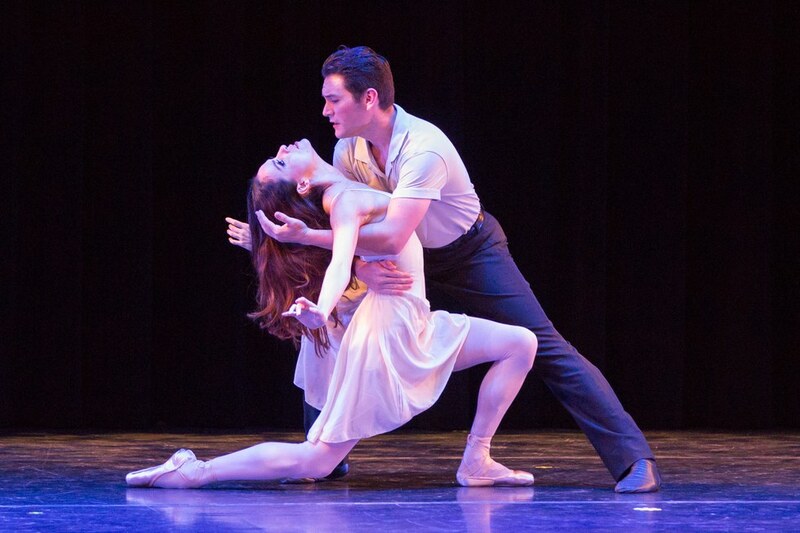 The Suzanne Farrell Ballet's Natalia Magnicaballi and Michael Cook in Balanchine's Meditation. Photo by Teresa Wood, Courtesy The Kennedy Center. What comes next is still unclear. According to a Kennedy Center representative, Farrell has been invited to "expand her teaching" within the new studio spaces being developed at the center. "We're still in the planning stages," echoes Farrell. Only one thing seems set—her three-week summer intensives (Exploring Ballet with Suzanne Farrell) will continue. She's also thinking about writing another book, a sequel, perhaps, to her autobiography Holding On to the Air. Whatever she does, she's unlikely to stray far from her core mission of teaching and passing on the ballets of George Balanchine. "I believe that ballet and Mr. B are my destiny," she says with quiet intensity over the phone, "and we'll go on somehow."